Toyota has refined the quality, performance, appeal and value of the Prius, the world's best-selling hybrid car. The 2012 Toyota Prius comes with higher equipment levels and improved ride quality, steering feel and vehicle dynamics as well as updated styling. In addition to the upgrades and added features, Toyota has made Prius $1,000 more affordable at $33,990* - $6,000 below the price of the first-generation Prius when it was launched more than a decade ago. Even the high-grade Prius i-Tech maintains its $45,990* price with the addition of substantial extra specification. Prius now has a reversing camera on the entry-level car with the image viewed on a 6.1-inch EGA colour display. The new model also incorporates daytime running lamps, power retractable mirrors and the power-saving JBL GreenEdge sound system with eight speakers. The Prius i-Tech gains 17-inch alloys as standard with solar moonroof, an eight-way power driver's seat, seven-inch VGA colour screen, hard-disk drive satellite navigation, digital radio and new leather-accented interior trim. The revised front of Prius reflects Toyota's new design approach, while the cabin has new front seats, new upholstery and new soft-touch surfaces that combine to give a higher-quality feel. Increased comfort and steering feel have been produced through a stiffer body and changes to the suspension and steering column. 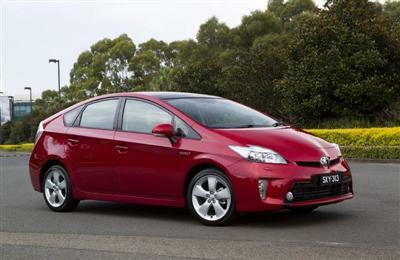 Prius sales globally have surpassed 2.5 million, including more than 17,000 in Australia. Over the next few months the Prius line-up will expand in Australia with the introduction of the compact Prius c city car and Prius v, the world's first seven-seat full hybrid car. Prius embraces Toyota's new, more assertive design approach with a stronger focus on the lower part of the car's front end. A new bumper and a larger, trapezoidal lower grille give the vehicle a low and wide look. LED daytime running lights have been placed in the bumper beneath the turn indicators, while the fog lights were repositioned within the lower grille. New power-folding heated door mirrors, new rear-combination lamps and newly designed 15-inch alloy wheels and covers are also part of the revised Toyota Prius. The styling changes add an extra 20 mm to the car's length, but the wheelbase and highly efficient aerodynamic performance (Cd 0.25) are unchanged. 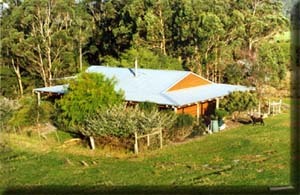 New colours are Dynamic Blue and Scarlet, for a total of eight. 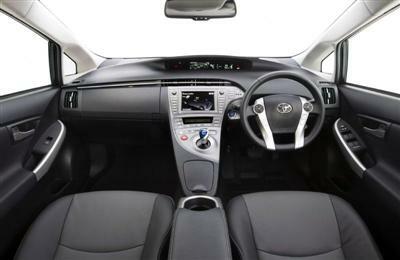 Inside, the look and feel of the trim, surfaces and upholstery raise the perception of quality. The front seats offer better support and provide a more comfortable ride, with eight-way power adjustment for the high-grade driver's seat. Toyota's attention to detail can be seen in the redesign of the centre console, which now has a built-in cup holder that can be used without having to open the console lid. The 12V power socket, USB port and AUX audio input terminal have been moved to the front of the console for easier access. New, darker materials are used throughout with silver inserts on the centre console and air vents. The hybrid system start button is now blue. The multi-information display has been revised with sharper image resolution, making the readouts easier to view. New functions include a monthly fuel consumption record with a rolling archive of five months' data and an ECO savings calculator. The calculator works by the driver inputting a target consumption figure and fuel price; the system records the driving time during which consumption is lower than the target and calculates a monthly saving compared with the expected fuel cost. The Prius body has been made stiffer by increasing the number of welding spots and reinforcements. Increased rigidity allows for softer suspension tuning, which improves ride comfort without diminishing the car's dynamic abilities. Redesign of the bracing has also made the steering column more rigid, which has the effect of giving the driver better steering feel. Additional sound-proofing materials have improved noise and vibration levels in the cabin. Prius has maximum power of 100 kW from the hybrid system which combines a beltless and highly efficient 1.8-litre petrol engine, a 650-volt electric motor/generator and a 201.6-volt nickel-metal hydride battery. With a full hybrid powertrain, Prius continues to deliver low CO2 emissions at 89 grammes/km. It also delivers outstanding fuel efficiency at 3.9 litres/100 km. Figures quoted are for the "combined cycle". Every Prius retains technologies that improve safety by providing 'at-a-glance' information, reducing the need for driver eye movement to allow better concentration on the road. A head-up display provides speed and other information on the windscreen in the driver's line of sight. When the driver touches the audio or information controls on the steering-wheel hub, Toyota's world-first touch tracer system displays a duplicate read-out on the instrument panel. The multi-information display monitors fuel and energy consumption, providing feedback that helps the driver employ economical driving habits. Other standard safety features include seven airbags, stability and traction control, active front head restraints and anti-skid brakes. In addition to driving like a conventional car, the hybrid system in Prius offers three driver-controlled modes: EV (electric vehicle), ECO and Power. In EV, the vehicle stays in electric-only mode for longer at lower speeds. The vehicle can operate up to about 50 km/h for approximately 1-2 km, depending on the state of charge. In ECO, the throttle is managed for fuel economy and the air-conditioning is strictly controlled. Power mode provides maximum acceleration response. As with its predecessor, the new range is covered by Toyota Service Advantage with services capped at $130 for each of up to six standard services in the first three years or 60,000 km (conditions apply and rental cars and government fleet vehicles are excluded).